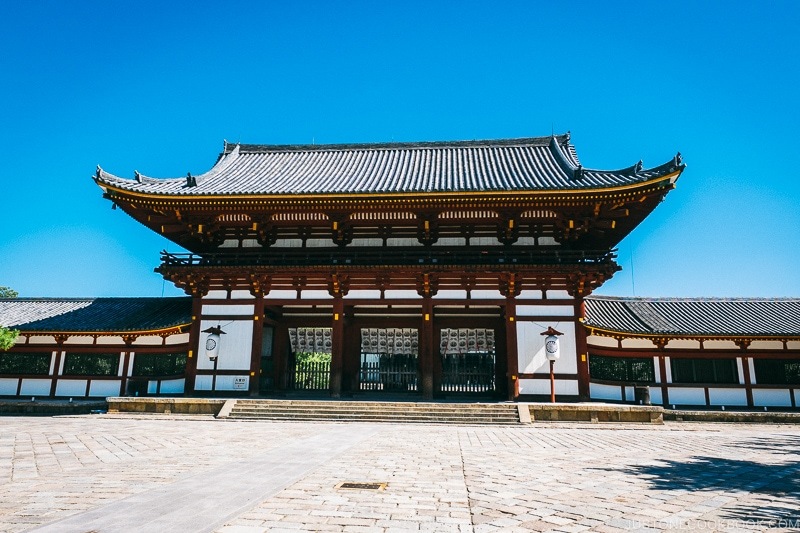 Todaiji is one of Japan most famous temples, dating back to 752. 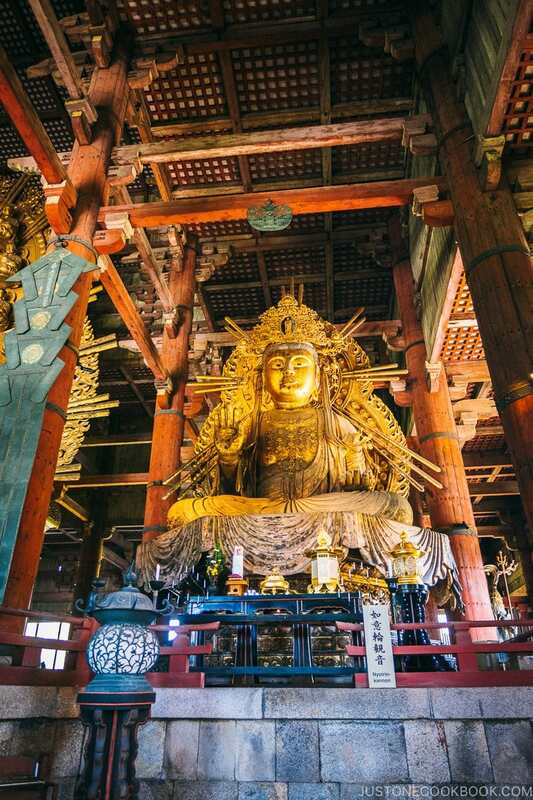 The gigantic wooden structure houses the world’s largest bronze Buddha statue. 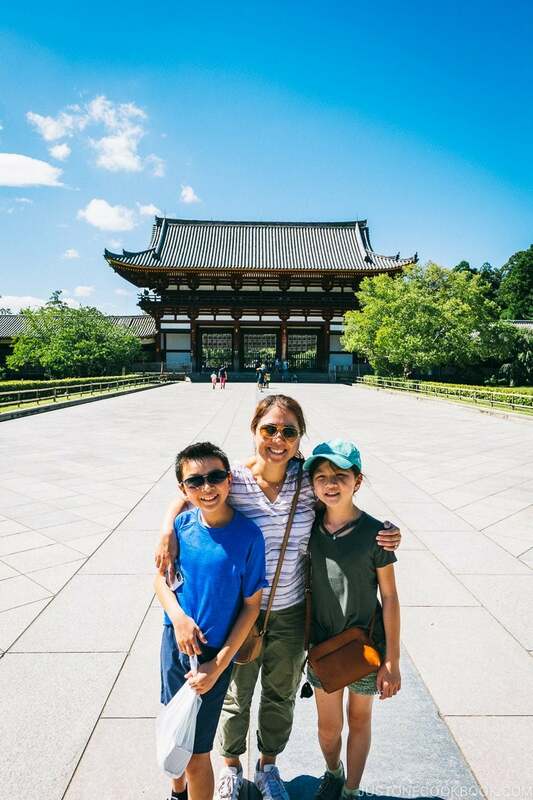 Todaiji(東大寺) is one of the most famous temples in Japan and a must stop for any visitors to Nara. 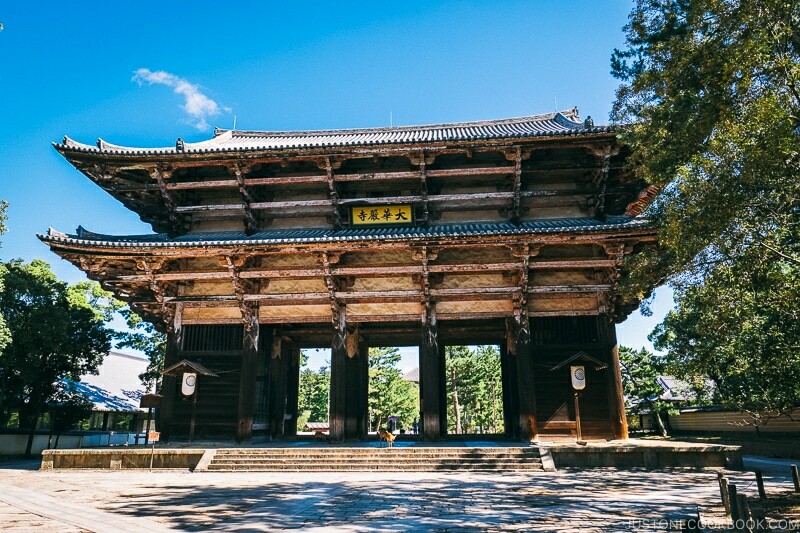 UNESCO World Heritage recognize it as part of “Historic Monuments of Ancient Nara”. 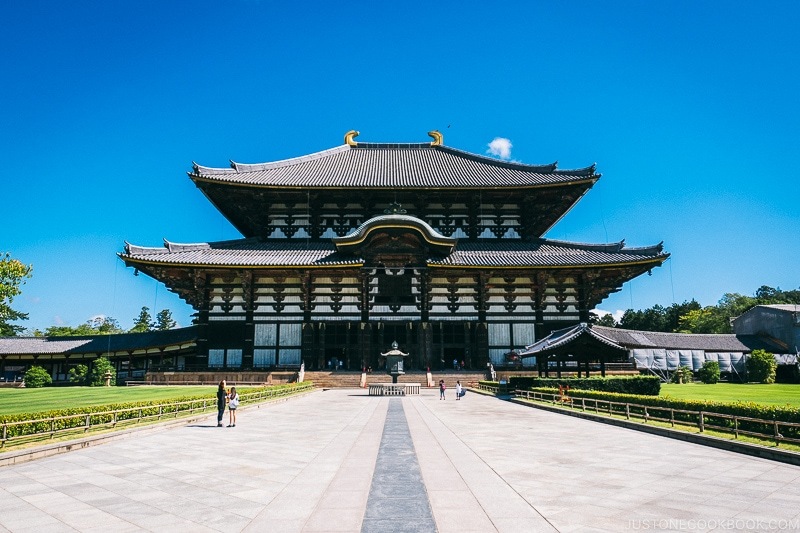 Todaiji is one of the biggest wooden building in the world and houses the bronze Great Buddha statue. 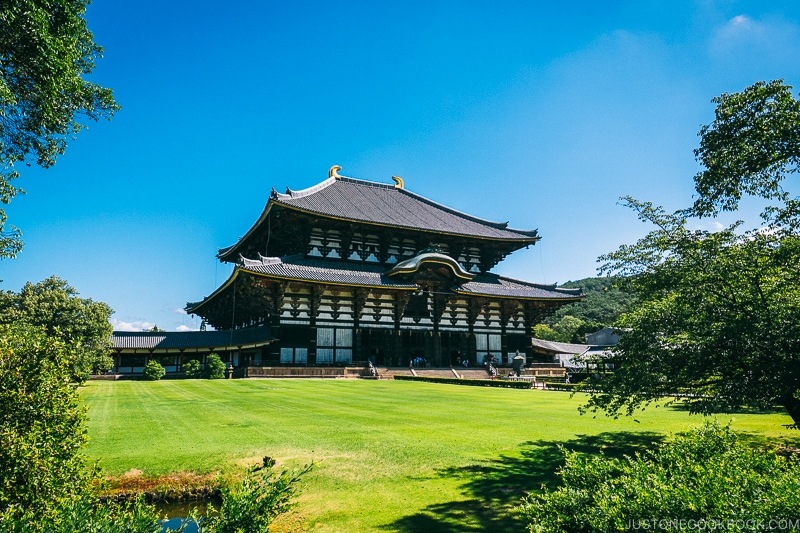 Todaiji is located east of Nara Station and you can get there on the Nara Loop Line, bus 77/78, and bus 97/98. 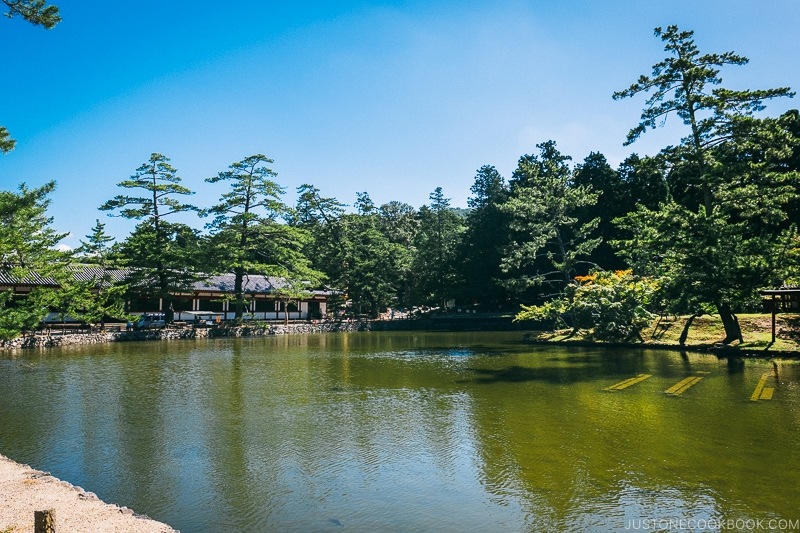 It is located within walking distance to Nara National Museum and Kasuga Taisha. 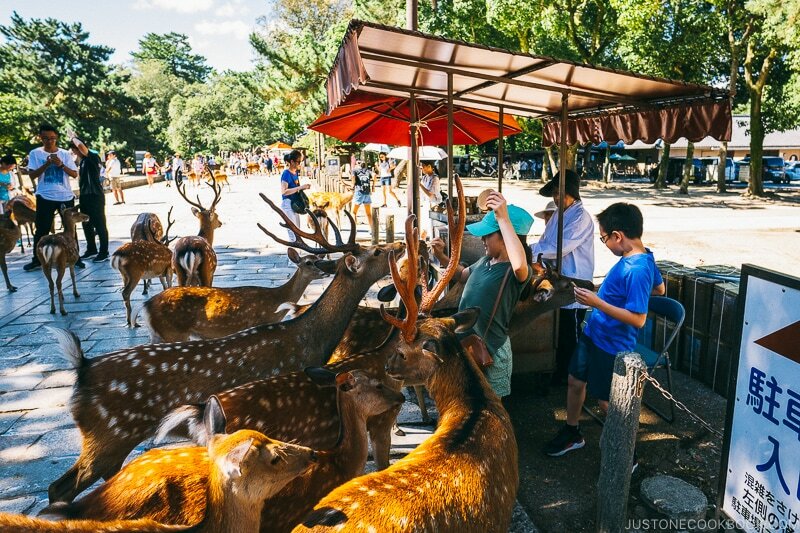 As you walk towards Nandaimon Gate (南大門) at Todaiji, you’ll notice many deer on the stone path and vendors selling biscuits to feed the deer. You can buy the deer feed but do watch out. 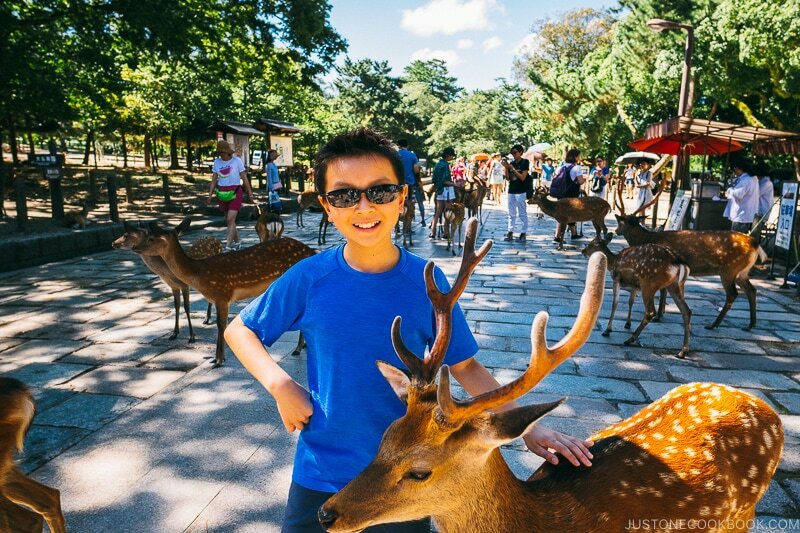 The deer are very aggressive if they see you with food and many of them will go up to you at once. If you don’t have food in your hand it’s much easier to take a memorable photo from the trip. 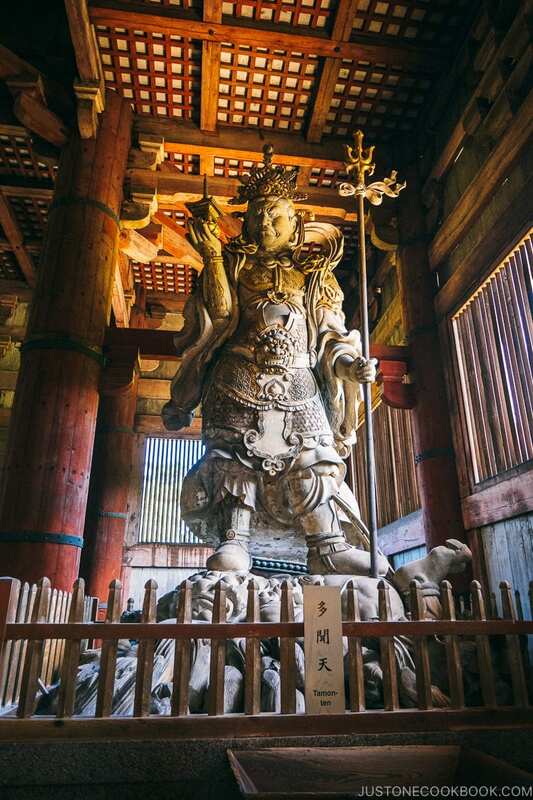 Emperor Shomu who had intertwined Buddism and state built Todaiji during his rule. During this time, Japan was experiencing a number of disasters including smallpox. 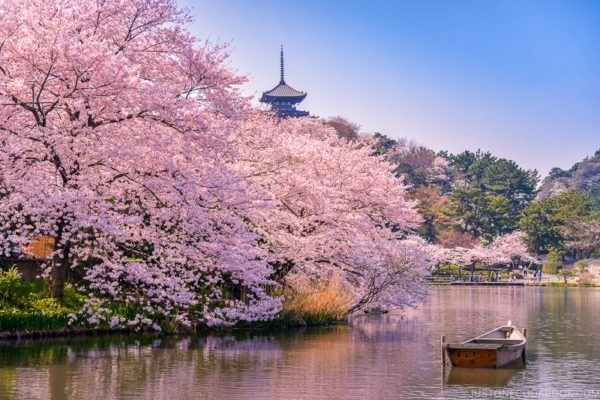 Believing that dedication towards Buddism will help his country, Shomu required each province to build its own temple and nunnery and appointed Todaiji as the head of all provincial temples(kokubun-ji). 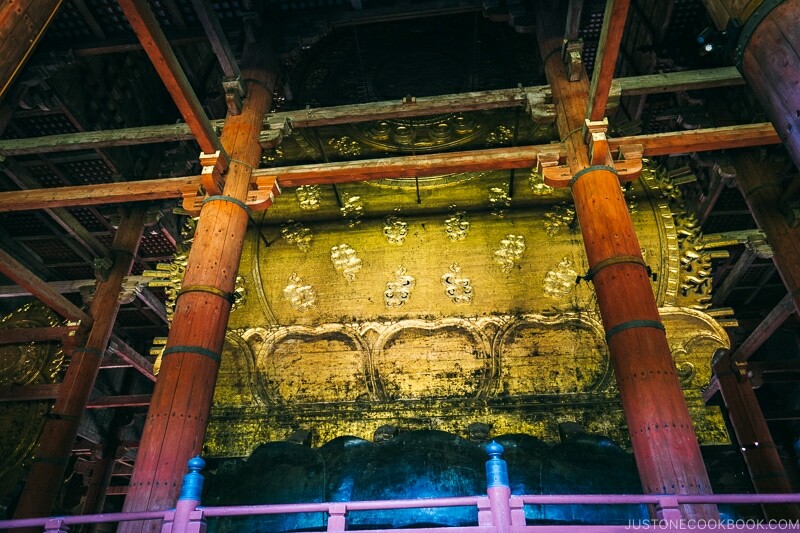 Todaiji has been rebuilt twice and today it is still head of Kegon school of Buddism. You can read more about its powerful history at Wikipedia and Khan Academy. 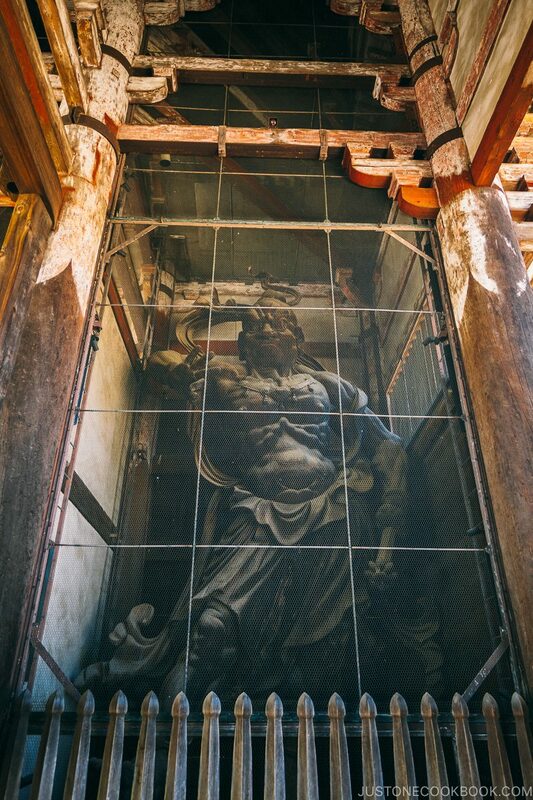 As you approach the temple, the first structure you will see is Naidaimon – the main entrance to Todaiji. 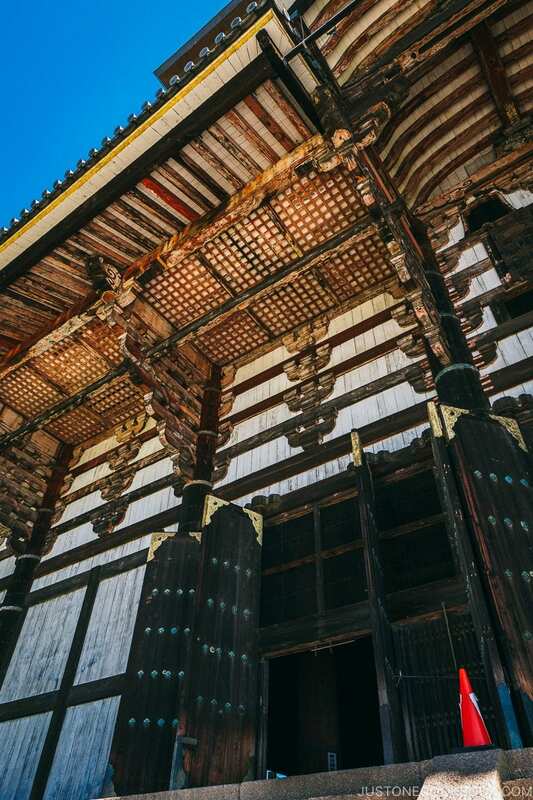 It is the largest temple gate in Japan and dates back to 1203. 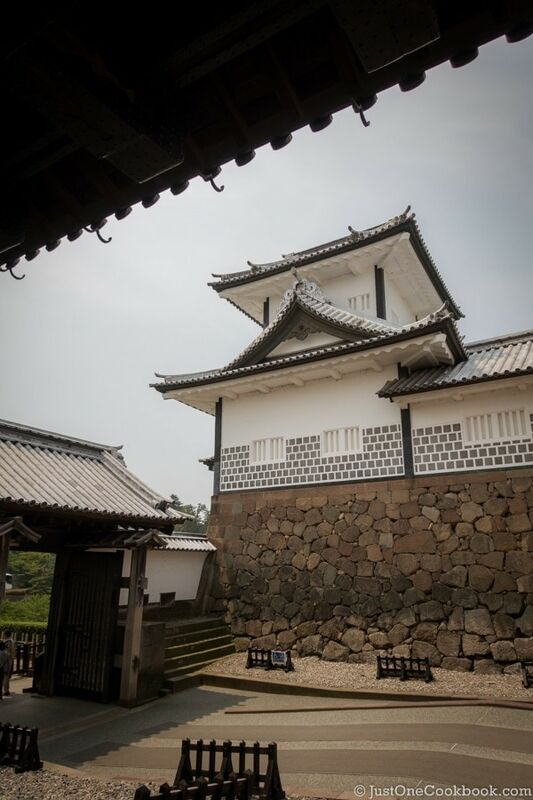 The gate sits on top of a stone base and as you pass through it there is a Niō (仁王) / Kongōrikishi (金剛力士) on each side. 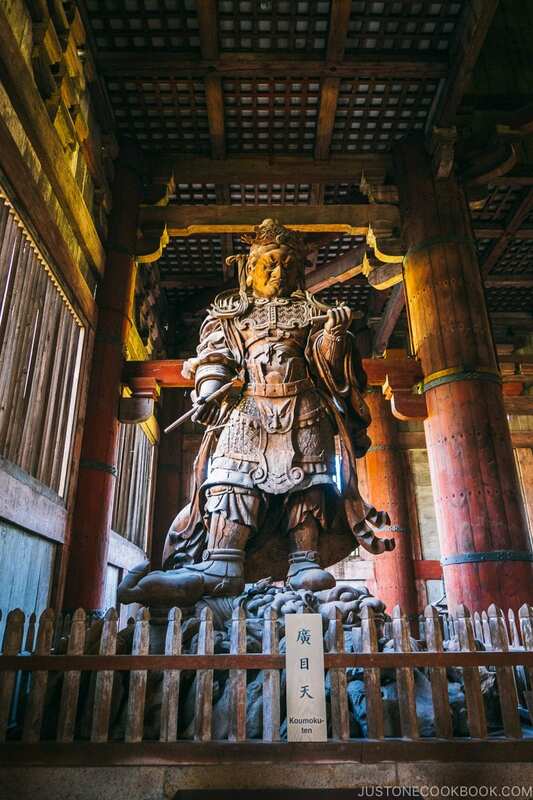 Each statue stands over 27 feet tall and was crafted by legendary sculptors Unkei and Kaikei. When the statues were being restored in 1988, hidden documents were discovered inside regarding the sculptors and Chogen who was influential with the temple rebuild in the 1100’s. 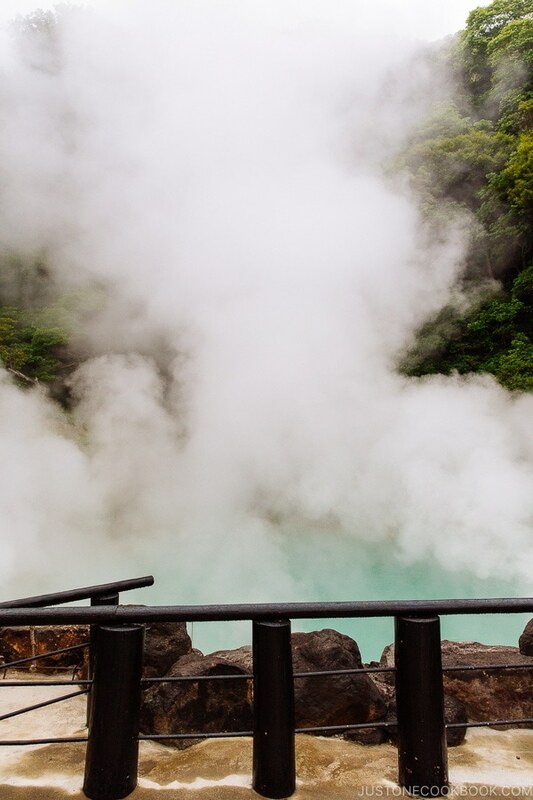 Once you pass through Nandaimon, you’ll pass by Kagami-ike (Mirro Pond) on the right. There is a shrine on the opposite side of the pond. On a clear and windless day, you can take a beautiful reflection of the temple in the pond. As you continue along the walkway, you will see the grand center gate. The ticket booth is to the left at the southwest corner of the temple. 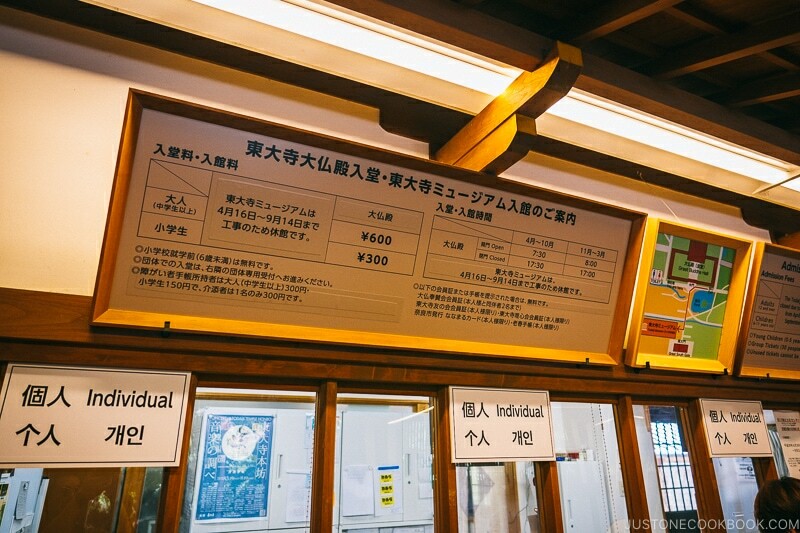 When we visited, it was 600 yen per adult and 300 per child to enter the temple grounds. 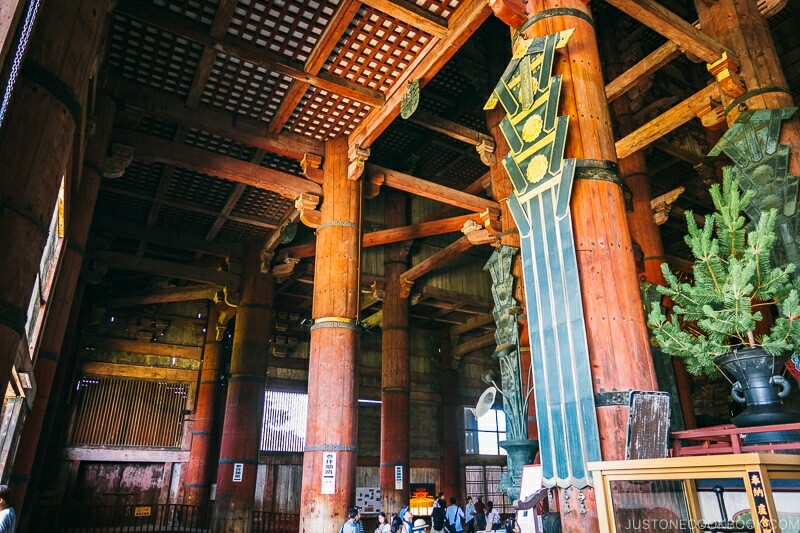 The current temple building dates back to 1709 and it is one of the largest wooden structure in the world. The height is almost 50 meters and 160 feet tall. When it was being rebuilt, due to the limited funds the building is 30% smaller than the ones built in 752 and 1215. The height and depth of the building remain the same but it is not as wide. 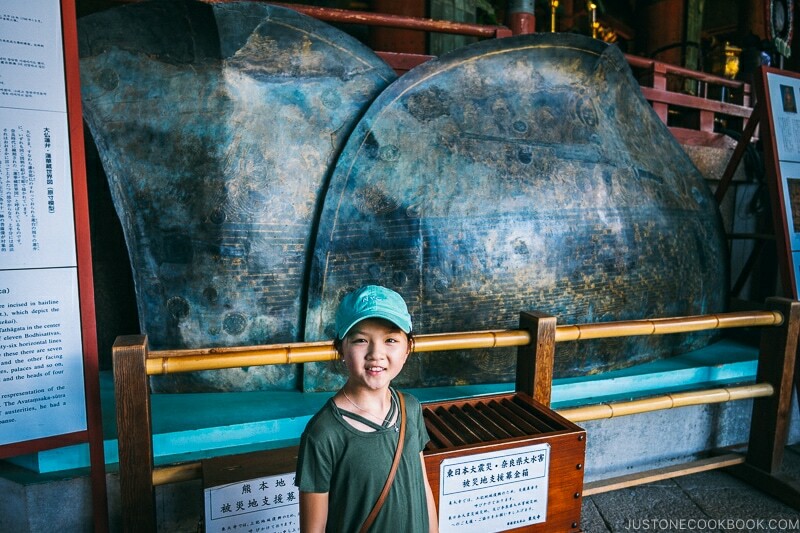 In front of The Great Buddha Hall is a bronze octagonal lantern and it dates back to the original temple in the 800’s. 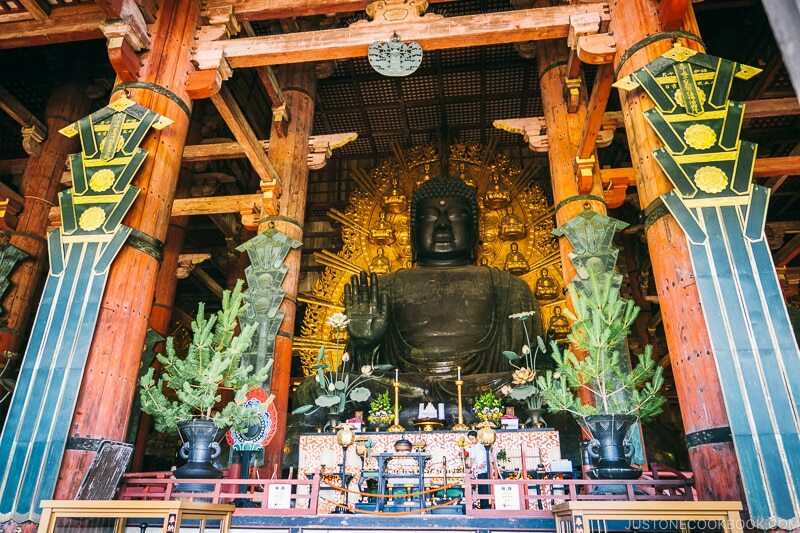 Inside Daibutsuden is the world’s largest bronze statue of Vairocana Buddha. It weighs 550 tons and is almost 50 feet tall (15 meters). The statue has been recast many times and the current one dates back to 1600s. It’s difficult to realize how large the statue when you’re there since everything is in perspective. After admiring the statue, walk to the left where there are replicas of the lotus leaves that the Buddha sits on. Now you see how large they are? 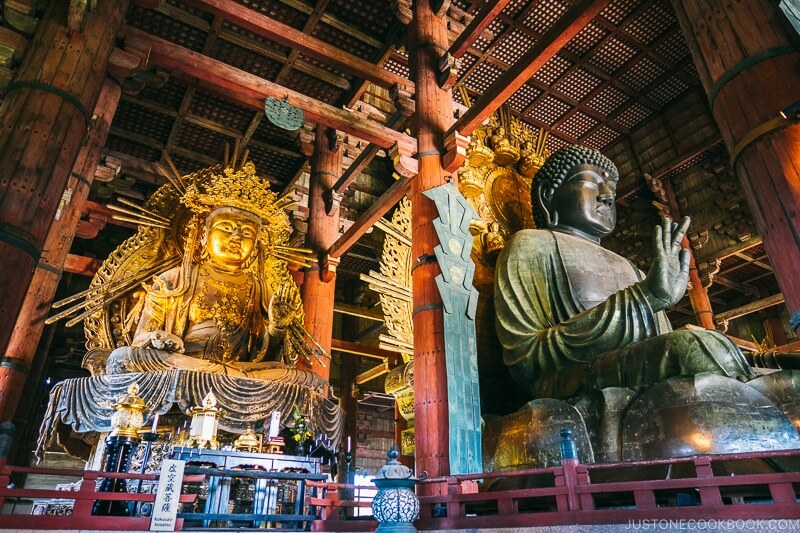 Besides the Great Buddha statue, there are two slightly smaller statues to each side of him and they are Kokuzo Bosatsu (God of Space Element) and Nyoirin Kannon (God of Mercy). On the farther sides near the walls, there are two additional statues of Buddhist gods, Koumokutan (God of the West) and Tenmontan (God of the North). Each of these statues is meticulously carved out of wood with amazing precision. The temple is supported by massive columns and one of them has a hole on the bottom. The hole is the same size as giant Buddha’s nostril. 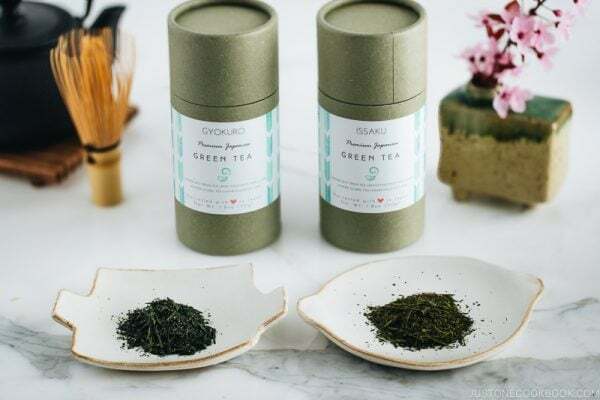 It is said if one goes through the hole, you will have good health and luck. Why the hole is there, you might ask? 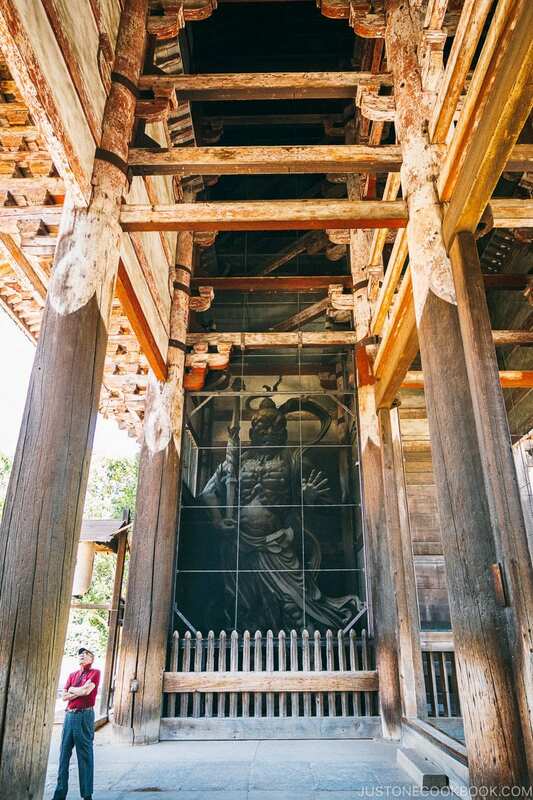 Though not 100% for certain, the pillar with the hole is located in the northeast corner of the temple and this is called Onmyodo (陰陽道) where the evil spirit resides. 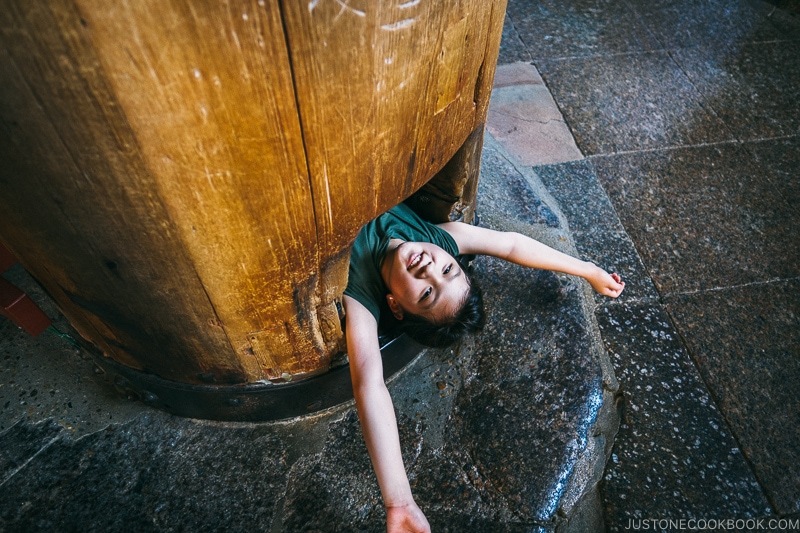 It is said the hole is there in the pillar for evil spirits to escape. 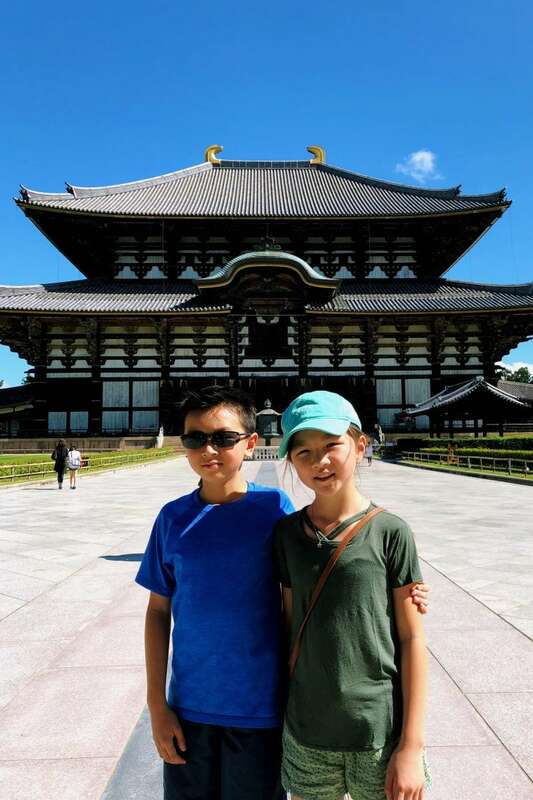 We hope you enjoyed touring Todaiji with us and stop by to visit the magnificent Great Buddha Hall when you’re in Nara. Our recommendation is to go to the temple early and avoid the crowd so you can take in the sights peacefully. Thank you for reading and we appreciate you traveling with us on our adventures. 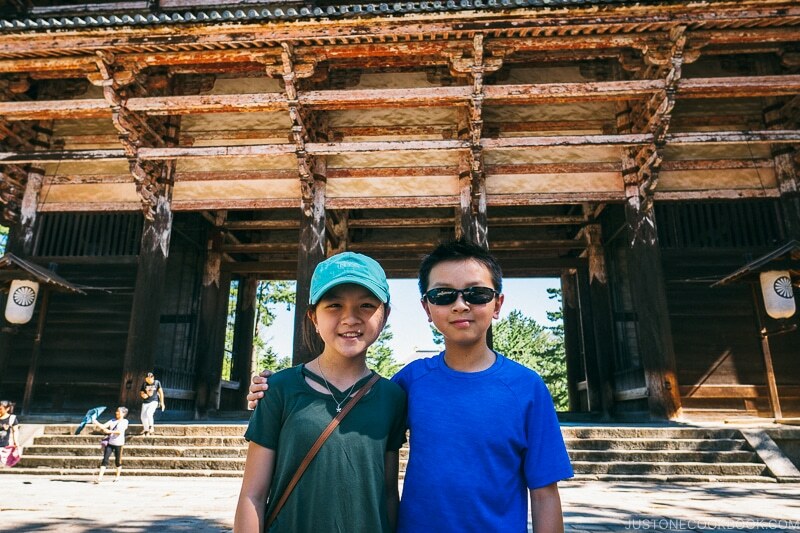 We’ll share our visits to “the seven great temples of Nara” soon and if you haven’t read about Kasuga Taisha, it’s another must-visit spot in Nara so don’t miss it. 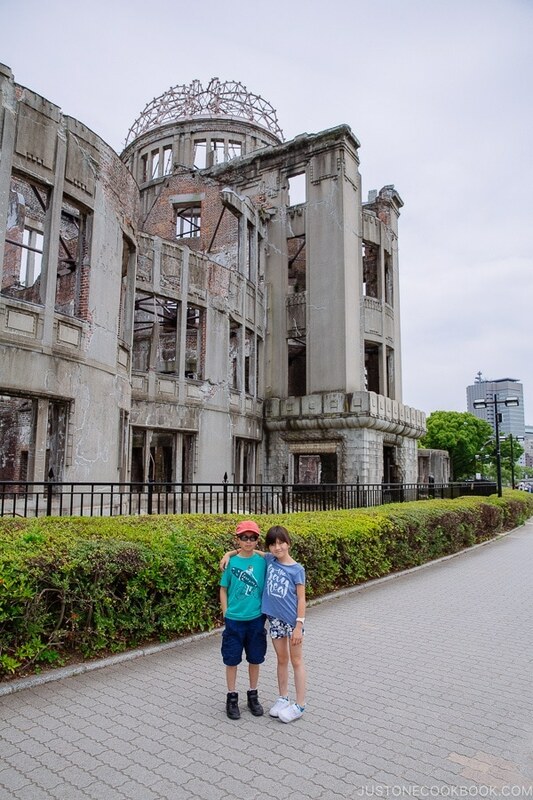 Check out the rest of our Japan travel here. 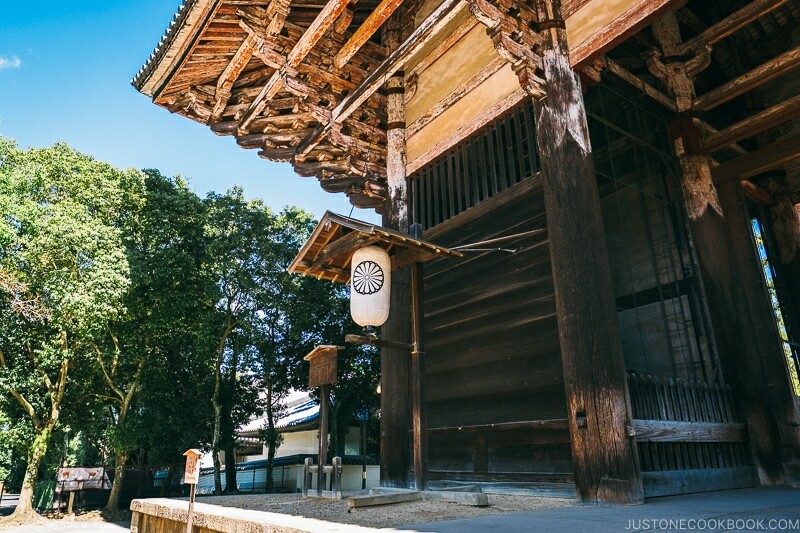 If you are interested in other Nara posts, check out our guide on Nara Temples and Shrine. 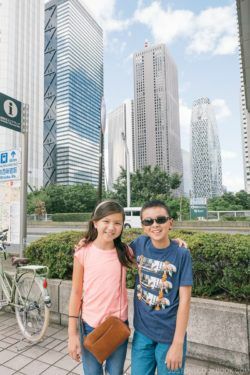 Japan is a fascinating place to visit and people are super friendly. Do try to make the trip. Airfare are very reasonable during low season (avoid summer and winter breaks).